Brief Synopsis – The arrival of a beautiful female photographer to a camp of animal hunters in Africa makes them begin to change the way they look at their work. 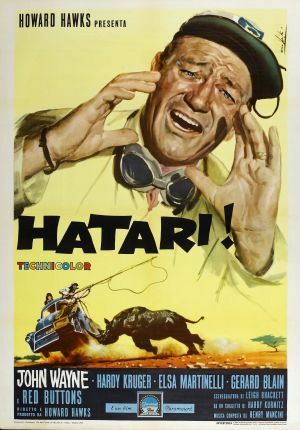 My Take on it – This is a film that I had never heard of before choosing it for this series based solely on the fact that John Wayne is in the lead. From a cinematographic perspective this film is shot beautifully and that has much to do with the fact that it was shot on location in Africa and the use of real animals for all of the scenes. Unfortunately, this film lacks any real emotional connection to the characters or storyline and that disconnect really takes much away from this film. Wayne is his usual self in the lead and this clearly is not among his best roles. He also lacks any type of realistic chemistry with co-star Elsa Martinelli which also hurts the story so much because it is quite dependent on their connection. Loved seeing Red Buttons in a fun supporting role but he is clearly only there for comic relief. They do a wonderful job filming the sequences featuring the various wild animals and things look extremely realistic from that perspective. Director Howard Hawks aimed for a realistic feel to this film and achieved that goal only with the animal scenes even if the human storyline is much less appealing or interesting. Bottom Line – Movie that looks great because of its location and premise yet lacks any real emotional connection to the characters or storyline. Wayne is fine in the lead but his chemistry with Martinelli is non-existent and this hurts the story so much. Buttons stands out only due to his comic relief. The sequences filmed with the animals are quite realistic and the fact that Hawks aimed for realism in this film is quite apparent despite the lack of an interesting story.